Dal Gosht (mutton in lentil curry), also called Chane ki dal ka Gosht or Dalcha, is an excellent curry-lentil combination on your dining menu. There are various methods of cooking this dish, this is the version that I have perfected after several tries. Use ghee (clarified butter) instead of oil for giving your dish a wonderful flavour. Give enough time for mutton to cook, this can be upto 35-40 mins under pressure depending on the type of mutton you have. If you are using chicken, it will cook much faster. Soak the Chana Dal for at-least 1 hour. Chop 2 onions, fry and crush them. Heat 2-3 Tbsp ghee in the pressure pan, add cinnamon, black cardamom and bay leaves and mutton pieces. Fry the mutton till all the water dries off and the mutton starts to brown. Remove and keep aside. Add ginger and garlic pastes, half of chopped green chillies, coriander powder, turmeric, red chilli powder and 1 Tsp garam masala powder to the pan with meat and fry till the oil floats up. Sprinkle water and fry for about 10 minutes and add the fried onion paste. when the oil starts to separate add the chopped tomatoes. Fry till tomatoes soften and mix well. Keep frying till the oil separates again. When the oil starts to separate, add the fried mutton, tomato puree and salt (to taste) and fry for a few more minutes..
Add the soaked chana dal, add some water (about 3 cups) and close the lid of the pressure pan. Let it cook for about 30 minutes in the pressure pan on medium/low heat. The mutton should get cooked completely by now. Let the pressure pan cool down a bit before you open it. Add 1 tsp garam masala, chopped mint leaves and chopped coriander leaves. Heat some ghee in a kadhai and add to it some asafoetida, cumin seeds, chopped garlic, ginger juliennes and onion. Fry it till the onions are caramelized and pour it over the cooked Mutton-Dal and cover it for a few minutes. Serve with Steamed rice and Roti / Parathas with salads on the side. Split bengal gram dal is made from Chickpea. There are three main kinds of chickpea. Desi has small, darker seeds and a rough coat. It is grown mostly in India and other parts of the Indian subcontinent, as well as in Ethiopia, Mexico, and Iran. Desi means ‘country’ or ‘local’ in Hindustani; its other names include Bengal gram or kala chana (“black chickpea” in both Hindi and Urdu) or chhola boot. Desi is probably the earliest variety because it closely resembles seeds found both on archaeological sites and the wild plant ancestor Cicer reticulatum of domesticated chickpeas, which only grows in southeast Turkey, where it is believed to have originated. Desi chickpeas have a markedly higher fiber content than other varieties, and hence a very low glycemic index, which may make them suitable for people with blood sugar problems. The desi type is used to make chana dal, which is a split chickpea with the skin removed. Happy that you liked it. Thank you. Sounds delicious ! Thanks for the recipe. Will definitely try it out ASAP. Thank you. Do let me know how you like it. In step 8. It is used for tempering. Point #2 – you have to brown the mutton and after it gets brown, remove it and keep it aside. 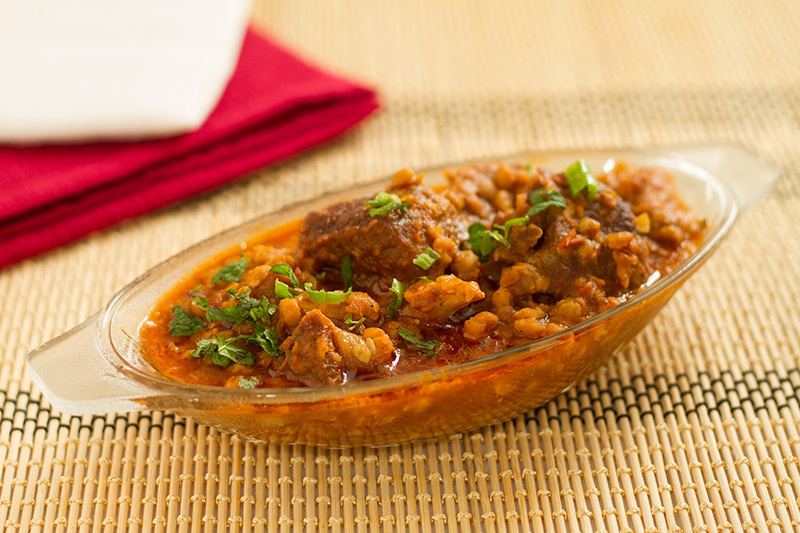 Point #5 – you have to keep this browned mutton back in the masala. Tried it today i.e. 5/4/15, came out really good. Thank you for the recipe. Keep up the great work and Keep’em coming.